The Genius 7 from Sidi offers a great fit, great performance and a great price! With advanced fit adjustment mechanisms available on a cycling shoe, the Sidi Genius 7 Road Shoe delivers amazing fit, adjustable on the go for full comfort. The MILLENNIUM 5 CARBON COMPOSITE SOLE features injected carbon fibre in a matrix of Nylon, providing more rigidity than a standard nylon sole. The MILLENNIUM 5 CARBON COMPOSITE SOLE is also more durable, completely non water-absorbent and mechanically stable, meaning it’s less susceptible to changes in stiffness resulting from ageing, prolonged usage, and changes in temperature or humidity. An anti-slip toe insert and replaceable polyurethane heel-pad are incorporated into the MILLENNIUM 5 CARBON COMPOSITE SOLE, for walkability. The MILLENNIUM 5 CARBON COMPOSITE SOLE uses a standard 3-hole drilling pattern for compatibility with the best pedal systems available and includes a printed 10 mm lateral and fore/aft cleat alignment scale on the sole as well as the Look Memory Eyelet for easy cleat alignment and replacement. The soft instep closure system is a wide, anatomically curved strap combined with a soft, thermo-formed EVA pad that distributes pressure evenly over the instep area. The system is micro-adjustable from both sides to perfectly centre the EVA pad over a high or low instep. The soft instep system is replaceable. This micrometric closure is adjustable by lifting the central buckle. In order to completely open, lift together both side buckles, or push the centre button to slightly loosen one tooth at the time. This allows precise and easy adjustment on the fly. A reinforced cup that stabilizes and supports the heel. Anatomically shaped plastic reduces heel slip and provides increased power transfer. Provides additional foot protection in the event of a crash. Integrated polymer teeth that lock in to place when you close the strap make for a more secure fit. With the strap becoming almost immovable, you can be sure of a secure fit. Regular Width is a standard Men’s D width. Put a piece of paper on the floor against the wall. Put your foot on top of the paper with your heel firmly against the wall. Make a mark on the paper at the end of your big toe. Measure from the end of the paper to the line you have drawn. If you have measured correctly, you will have an accurate foot length in millimeters. Repeating the steps a few times will allow you to be sure you have measured correctly. The length in millimeters on the size chart refers to the size of the last used, so if your foot length falls between sizes, be sure to size up rather than down. Sidi Genius 7 Road Shoe is rated 4.0 out of 5 by 4. Rated 4 out of 5 by kid79 from Generally happy with this shoe As above, generally happy with this shoe. Bought in May this year and have done about 2000 miles in them longest spin being 140 mile charity spin. 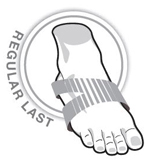 Insoles are essential as the standard insoles are extremely hard, so keep this in mind when sizing. I can get the shoes nice and tight and they stay tight all day. They clean up real well and Velcro straps holding up well also. I didn't buy the dearer Sidi shoes as I didn't like the shiny patent finish. All good. Rated 4 out of 5 by RobertvW from Good but wider than I thought I always wore Sidi shoes that were a perfect fit. The first set I ordered were too small. Exchange with Wiggle perfect however the second set slightly wider than I needed.... Nevertheless always a good product. Rated 4 out of 5 by LaurenceM from Good shoe for road cycling I was looking for new cycling shoes for a while as my old pair were pretty run down. I eventually landed on these Sidi shoes as a friend recommended them. I've used these for a couple of months and I've been very happy with them. They don't use the Boa securing system which is a plus in my book, and have two velcro straps which help tighten the fit. They're also a very good looking shoe. I have, however, found that the ratchet tightening strap can get stuck when taking it off and I'll have to re-tighten and then pull it out. Nothing major, but it is quite frustrating. Rated 4 out of 5 by MikeB321 from Good shoe Comfy, easy to adjust and looks good! Haven't used SIDI shoes before but am happy with this one. Can you help me with sizing - Your Sidi size guide suggests a size 39 based on my foot length measurement. However I usually take about a size 7 in every day shoes. My current cycling shoes are size 42 Mavics. What size would you suggest in Sidi? We would recommend the 41 for a UK7. Sidi Genius 7 regular or mega fit? I am reluctantly replacing my 25 year old Sidi Genius 2's. They are a perfect fit, but the label has rubbed off so I don't know what size they are. They're probably 46, but what width fitting is likely to be closer to my G.2's, regular or mega? I believe the regular fit will be the same fit as your current shoes. I hope this helps. I am uk size 9. Size 43.5 or 44 for the sidi? We would advise opting for the larger size with Sidi shoes. What kind of shoe plates should I need with them? These will fit with LOOK Keo pedals and you will need the cleats on the link below. Hey, A UK10, US 45 Giro Empire fits me perfectly...what size would you recommend for these? Thanks.